If your doctor has told you that you'd benefit from weight loss, then lose weight in a way that sets you up for a lifetime of healthy habits and feelings of well-being. At age 15, you may have reached 90 percent of your adult height, but your body is still developing, and that means you need nutrients to support your bones, brain, hormones and muscles. Gradual dietary changes and adequate exercise can help you achieve a healthier weight. But don't purposefully limit your intake of whole, unprocessed foods such as vegetables, fruit, lean proteins and whole grains. Instead, cut back on junk foods, which are calorie-dense foods and contain little nutrition. As a 15-year-old girl, you need an average of 1,800 to 2,400 calories daily, depending on your height and activity level. Instead of following a fad diet that bans whole food groups and promises quick weight loss, eliminate the foods that aren't doing your body any favors. This will help you reduce calories, approximately 250 and 500 per day -- depending on your size and your calorie burn rate -- to lose 1/2 to 1 pound per week. Speak with your doctor or dietitian to determine a calorie intake that's right for you. Soda, candy, sweets, chips, snack mixes, cereal bars, sugary breakfast cereals and white bread are items that contain a fair number of calories but offer few quality vitamins and minerals. Choose foods that have a higher nutritional value and fewer calories. Snack on fresh fruit, low-fat cheese and yogurt, 100-percent whole-wheat crackers, hummus and cut-up vegetables. You'll need 5 to 6 servings of whole grains daily. An serving is one slice of whole-wheat bread or 1/2 cup of brown rice. Each day you should also aim for 2 and 1/2 cups of vegetables; 1 1/2 cups of fruit; 3 cups of dairy; and 5 ounces of protein such as chicken, fish, lean beef or tofu. Add in a little healthy fats such as those found in peanut butter, olive oil, nuts, avocados and salmon each day, too. At meals, avoid fried foods, creamy dressings, creamy sauces and white pasta. Choose grilled or broiled meats, fresh salads topped with olive oil and vinegar, steamed or roasted vegetables and whole grains such as brown rice, quinoa, whole-wheat pasta or 100-percent whole-wheat bread. These changes will instantly trim calories while helping you get optimal nutrition. Sample meals for a 15-year-old trying to manage her weight include the following: for breakfast -- oatmeal with berries and skim milk; for lunch -- a turkey sandwich with tomato, lettuce and mustard, carrot sticks and low-fat yogurt; and for dinner -- corn tortillas filled with lean steak, salsa, avocado and brown rice. A serving of dairy, such as milk or yogurt, is particularly important for teenagers at meals and snacks, as it supplies bone-building calcium and vitamin D.
When you lose weight without exercise, your body breaks down muscle mass for energy, which results in burning fewer calories. Prevent a drop in muscle with strength training and exercise. 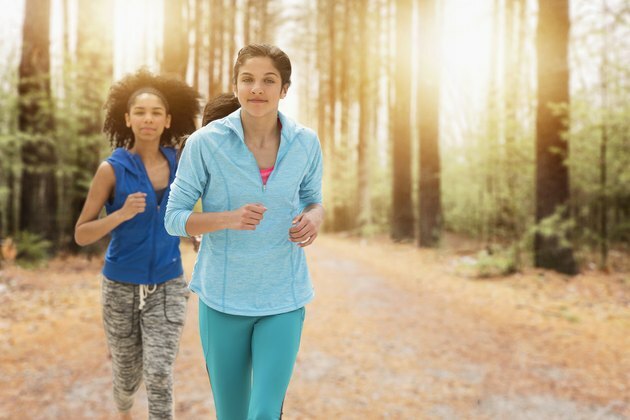 As a teen, you should get at least one hour of exercise daily. This might involve walking briskly, taking a dance fitness class, riding your bike or playing sports. Experiment with different types of exercise to find the types you enjoy most. Being active burns calories naturally so that you won't have to cut back on healthy food to lose weight. It's also important to strengthen your body so that your muscles help boost your metabolism. You don't have to hit the gym, but doing push-ups, gymnastics and yoga also count as exercise. If you do go to the gym, consult with a trainer or coach to make sure you do the strength-training exercises correctly. One or two sets of a weight exercise that trains every major muscle group -- the hips, shoulders, chest, back, arms, legs and abdomen -- two or three times per week as part of your one-hour daily routine is beneficial to weight loss. Eating when you're stressed or bored doesn't promote a healthy weight. A 2014 study that was published in the journal BMC Public Health, found that girls are more prone to stress eating and, as a result, are more likely to be overweight and obese. Instead, call a friend, go for a walk or listen to music. Also, learn to notice when you feel full, and then stop eating. Overeating can be a habit that deters weight loss. Slow down, because it takes up to 20 minutes for you to notice that you feel satisfied. Remind yourself that every person has an individual build and that very few people look like supermodels and stick-thin actresses. Don't be overly hard on yourself if you do eat something that's "off" your plan. Just get back on track the next day. You can't expect to ban your favorite foods forever, but learn to indulge in them occasionally and responsibly. TeensHealth: How Can I Lose Weight Safely?